Choose felt by material type - Various densities, thicknesses & colors available. Choose filtration media by application or micron rating - Available in various materials, densities & thicknesses. Choose nonwovens for your industry application – Medical, Auto, Industrial, Aerospace & more! Superior Felt & Filtration is the choice nonwoven supplier for many industries, including Filtration, Industrial, Automotive, Medical, Appliance, Decorative, Aerospace and more. As a leading nonwoven manufacturer, we offer exceptional quality with the largest inventory in North America. Our nonwoven textile manufacturing and distribution capabilities allow us to offer a diverse range of felt and filtration products from roll goods to a finished component. 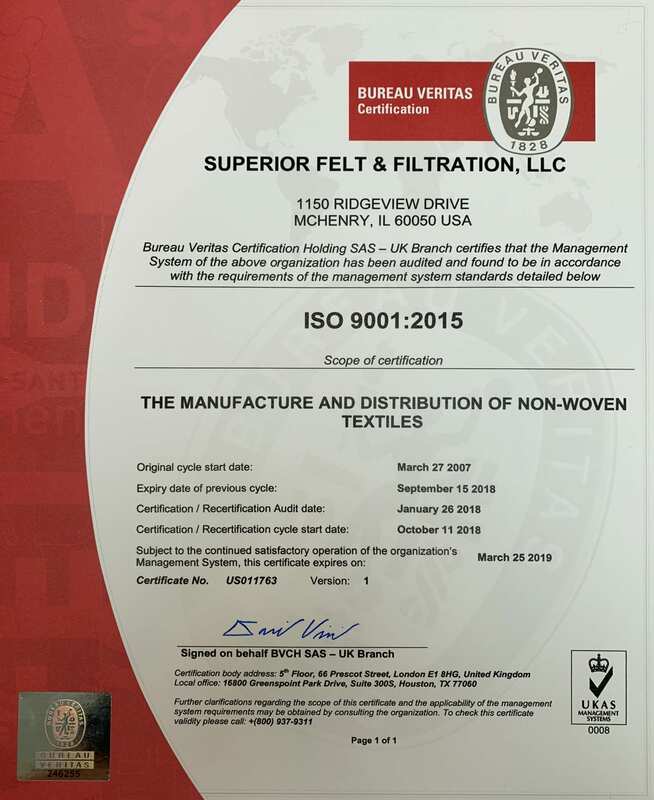 As an ISO 9001 company, Superior Felt & Filtration is a leading felt company in the nonwoven textiles industry. We can help you determine the best solution for your felt & filtration needs.